The Gannon University women’s and men’s cross country teams finished 16th and 29th, respectively, at Saturday’s Pre-Nationals race at Slippery Rock University. A total of 30 women’s teams competed in the event and 29 men’s teams also took part in the race, which was held on the same course that will host next month’s regional and national races. Among all Gannon runners, Joseph Westrick had the top individual finish, as he placed 19th in the men’s race with a time of 25 minutes, 58 seconds. Gannon coach John Carrig was very proud of the men’s team’s performance. A total of 305 runners took part in the men’s 8K event. Gannon’s Eric Ingram finished in 117th place with a time of 27:41. He was followed by Ryan Garich (158th, 28:10), Garrett Sutton (189th, 28:43), Kyle Martin (230th, 29:26), Brett Whitty (249th, 29:59), Max Battaglia (278th, 30:59) and Mitchel Daubert (291st, 32:04). Colorado Mines University won the race with 19 points followed by Mount Olive (126), Queens (126), Cedarville (158) and Malone University (164). Grant Colligan of Colorado Mines won the event with a time of 24:57, and his teammates finished second, third and fifth. Gannon faced six nationally ranked teams Saturday: No.3 Colorado Mines, No. 6 Queens and No. 9 Mount Olive. A total of 32 Division II squads came from Colorado, Florida, Massachusetts, Michigan, New York, North Carolina, Ohio, Pennsylvania, South Carolina and West Virginia. The men will return to action Nov. 3 at Edinboro for the PSAC Championships. 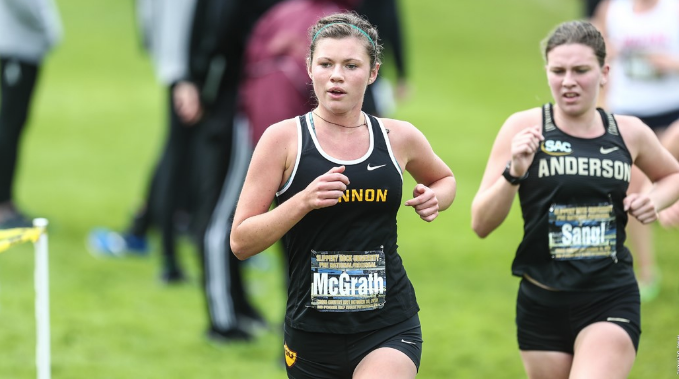 The women ran a 6K race with Grace McGrath placing 58th with a time of 24:09 to lead the Gannon women. McGrath was followed by Meredith Morse (79th, 24:42), Sarah Fiorello (97th, 25:00), Alena Wisniewski (135th, 25:34), Ashlynn Uzi (147th, 25:51), Tori Panian (167th, 26:14), Cameron Perry (177th, 26:26), Taylor Roberts (192nd, 26:48) and Allie Domer (219th, 27:19). Carrig complimented his team for a solid performance. A total of 395 racers from 30 schools competed in the race with six nationally ranked squads making an appearance. Colorado Mines won the race with 37 points followed by Walsh (91), Hillsdale (128), Roberts Wesleyan (157) and Queens (176). Leah Hanle of Mount Olive took first place in 21:54. Carrig said that so far on the season, both the men’s and women’s teams have been performing well. “Overall both teams are working hard and I expect good things to happen at PSACs and regionals,” he said. The women’s next race will be at the PSAC Championships hosted by Edinboro on Nov. 3.